Amazing Grace Turns 1 and Celebrates with a Bang! Grace’s Amazing Grace turns 1, and she’s holding a blogversary contest to celebrate. Everyone is invited to join! 1. Make a post about this contest and add Grace’s sites Amazing Grace, A Walk to Remember, Gracia Fashionista, and Bucket of Wisdom to your bloglist. 2. Return to her blogversary post and leave your comment with the URL of your post. 3. One entry per blog site. 4. Bloggers outside the Philippines are welcome ( just leave a Philippine address for the delivery of the items). 5. 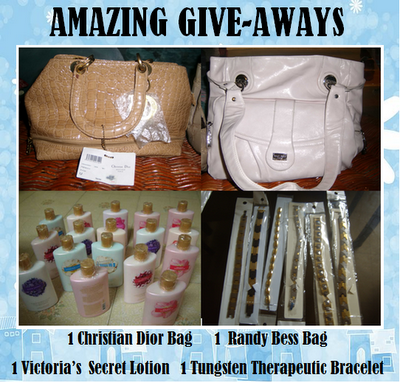 One winner for each item. Winners will be drawn through random.org. 6. Contest runs from May 01 – June 15,2010. Don’t be left behind. Join in the fun! This entry was posted in Amazing Grace, Blogversary Contest. Bookmark the permalink.